Anime and Music have existed at intersections throughout all of known recorded history. Immediately upon viewing, the gif gives off the immediate aroma of grasses mixed with various herbs, creating a calming and serene atmosphere. Here we recommend a pairing with First Light, from Harold Budd & Brian Eno’s – Ambient 2: The Plateaux of Mirror. Brian Eno – known as the grandfather of ambient – is at the height of his production skill here, producing the shining jewel of his Ambient series albums: with the virtuoso piano skills of Harold Budd. The crisp, clear piano notes are evocative of a rolling, lush hill. A lesser known fact about the album is that due to the analog equipment used, the faint hissing of tapes can be heard throughout. This parallelism with the slow swaying of the gif creates a beautiful, contemplative pairing perfect for lazy thursday afternoons. Coincidentally, Ookami Kodomo is also the same movie that produced the first Lo-Fi hip hop stream gif, so in a way, this pairing is really bringing it all home. Amazing. Source: Yojouhan Shinwa Taikei, by Masaaki Yuasa. Here we can see a movement towards a more eclectic gif, owing to the personal style of director Masaaki Yuasa. The image manages to convey simultaneous impressions of beauty, indifference, and warmth. Although it would be possible (and possibly safer) to pair this with a safe soft-rock number ala Fleetwood Mac or Belle and Sebastian, I personally opt to match the explosive style with something equally strong. In this case, In The Aeroplane Over The Sea by Neutral Milk Hotel, from the album of the same name, perfectly captures the heartfelt charm of late autumn nights. Hell, this track is so hipster I can’t even identify a quarter of the instrumentation. This is a sophisticated pairing, best reserved for a cool, crisp October dusk. This gif’s flavor is decided bittersweet and melancholy, partly owing to the heavy use of blue color grading. Disillusionment is the heaviest flavor present. Here, many pairings are possible, but I opt for Radiohead’s – OK Computer, specifically the track Let Down. Thom Yorke stated about the track in a Rolling Stones interview: “If you spend all your time time traveling on airplanes or on buses or whatever, you’re bound to get this sense like in “Let Down.” It’s like hanging onto something and having the floors collapse underneath you.” The deeply arpeggiated guitars and wall of sound production create the perfect expression of the modern existential malaise. This is a pairing for the inescapably lonely, cold winter nights. Here we see a gif showing a heady Industrial flavor, with hints of Grime. The atmosphere is heavy and ominous. The perfect pairing here is Bloodhail, from Have a Nice Life – Deathconsciousness. Deathconsciousness is an album that blends eclectic influences: heavy metal, drone, post-punk, shoegaze, and industrial to create an album that paints a uniquely dark vision. The powerful yet muddled drums drive the track inexorably forwards, contrasting with the almost beautifully indifferent vocals. This is a pairing built upon the tiny fragments of hope and beauty to be found within the infinite darkness – or in other words, the spiritual successor of every Tokyo Ghoul AMV to be found on youtube. If I’m going to be completely honest, I just came up with this pairing because I’m too dumb to understand either End of Evangelion or Classical music. The composition here is Arvo Part’s – Tabula Rasa. Tabula Rasa is a latin phrase, meaning “blank slate”, which has been an important philosophical theory of knowledge that all knowledge is learned and there is no preexisting knowledge. 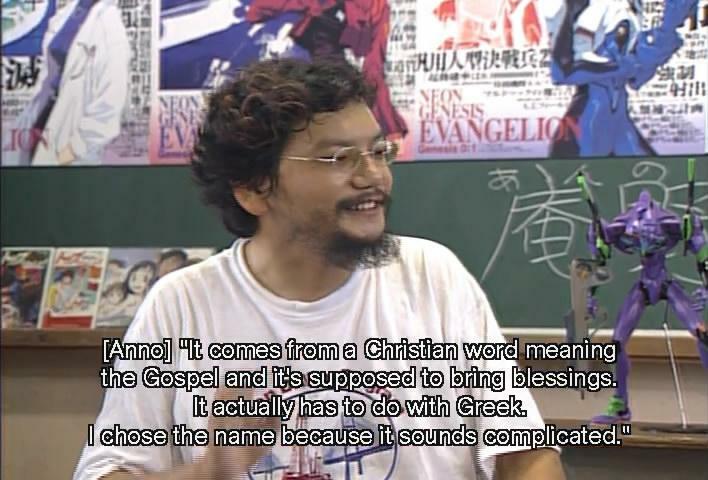 I’m not quite sure what Evangelion means, but I’m sure it’s also something very deep that Anno chose for an incredibly deep symbolic reason. Moving onto a meta-analysis of each work, we see another parallel appear – Arvo Part’s modern classical is based on a form of classical minimalism he developed, known as tintinnabuli. As a minimalist arrangement, the piece is partially a deconstruction of the classical canon and the concept of an orchestra. In a similar way, Evangelion acts as a deconstruction of the Mecha genre. For example, in one scene, the characters Rei and Asuka stand in an elevator for a minute: in ANY OTHER mecha series, the viewer would expect them to have a conversation crucial for plot exposition or character development, but Anno expertly deconstructs that by instead having them do… absolutely nothing. In any case, at it’s core, both are incredibly deep, introspective, and seminal works in their respective media, and make for a natural pairing. I am certain that both Arvo Part and Hideaki Anno’s works will continue to be known even generations from now.